there was plenty of spaces... and i'm betting we could have skipped the reservation and went down the road another 1/4 and used the alternate campground with better "welcome"
Cons: Older KOA, with all gravel for pavement. We had to make last minute change vacation plans, on the road from Grand Canyon. 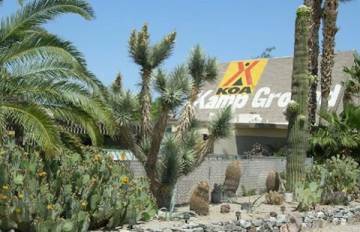 KOA Needles had a 50A site available online, so we booked via the iPhone. Glad we got the 50A spot, as it was 110 outside. Wifi was slow, but the pool was very inviting. The lady at the desk was able to pull up our reservation quickly, with the email confirmation number. We were in our spot, plugged in and cooling off, inside of 10 minutes from when we roll up. The location is right on the old Route 66, which was far enough from the Interstate to be silent for sleeping. Always bring your A game.